In 1818 the Portreeve and Burgesses of the Corporation build a Sunday School for St John's church in Vicarage Street, later to become the Vicarage Street Hall. It was designed by a Mr Churchouse and built by William Thomas at a cost of £375. It was in this hall that the Town Commissioners held their first meetings. A campaign was begun in 1839 for a Church of England day school for boys and in 1843 the Vicarage Street Sunday School building was being used to teach seventy boys. Unfortunately the schoolmaster threatened to resign because of the unhealthy conditions which eventually resulted in the building of the first National Day School in Huish. The Sunday School was moved to Church Street in 1854. In 1856, Vickery wrote "A Yeovil Mutual Improvement Institution has existed in the town since the year 1847, when it met at Mr. Aldridge's school-room, Clarence-place, and numbered 20 members. These premises were far from adequate to supply its progressive requirements. It was then removed to a room in Vicarage- street, formerly the Church Sunday Schools, and now used as a chapel by the Brethren. It afterwards occupied the room over Mr. Watts's wine vaults, Princes- street." It was acquired by the Plymouth Brethren and for several years was also run as a British (Nonconformist) School. Vickery continued "This place of worship is situate in Vicarage-street, and was purchased for £200, about the year 1850, of the Town Commissioners. It had formerly been part of the property of the Portreeve and Burgesses, by whom it had been built as a Church Sunday School for the town. Mr. William B. Dyer usually ministers at the place. A Sunday and a Day School are attached to the building." A map based on the 1886 Ordnance Survey of Vicarage Street showing the Vicarage Street Hall marked as 'School' just right of centre, just below the 'C' of Vicarage Street. 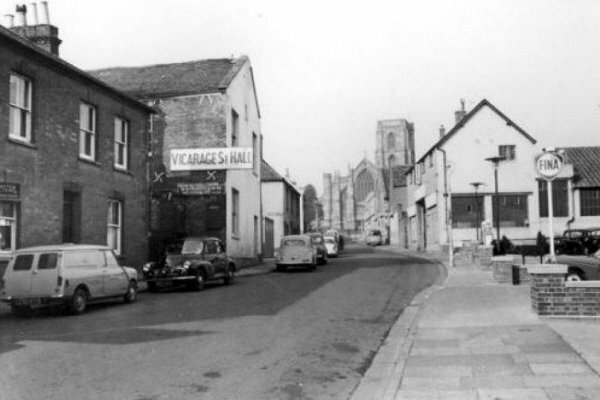 This 1960s photograph shows the Vicarage Street Hall, immediately beyond which is the entrance to Quidham Place. 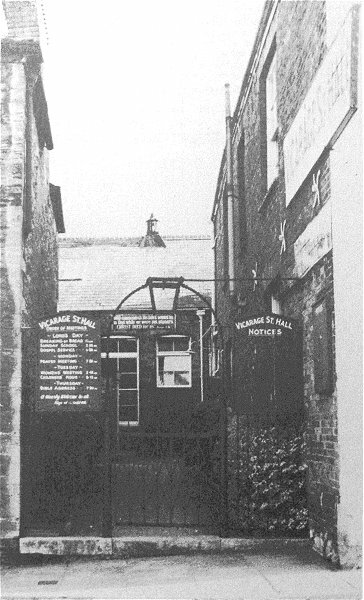 .... and moving just a bit further along Vicarage Street, this photograph shows the entrance to Frederick Place. 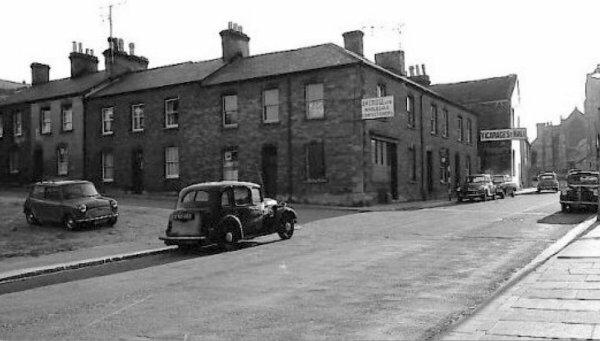 Vicarage Street Hall, probably photographed in the 1950s. 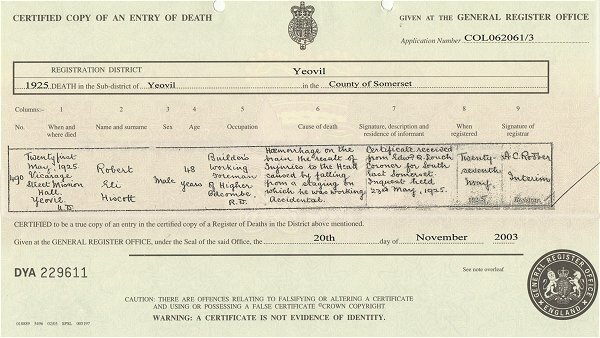 A copy of the death certificate of Robert Eli Hiscott who died 21 May 1925 at the Vicarage Street Mission Hall while working as a builder's foreman in the building. His death was the "result of Injuries to the Head caused by falling from a staging on which he was working. Accidental."